Dell XPS 12 is yet another hybrid that looks to contest for market space with Microsoft’s range of Surface tablets like the Surface Pro 4. It sports probably the best display ever seen on a 2-in-1 device and comes with a sturdy keyboard, latest Intel Core processor and Windows 10 OS. 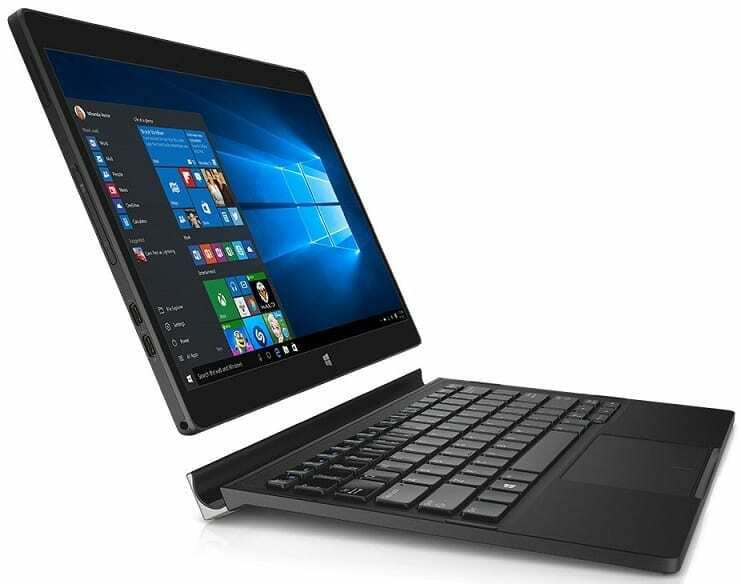 Dell XPS 12 shows off a detachable design that enables you use it either as a tablet or as a laptop when paired with a keyboard. A series of strong magnets makes pairing the slate with a keyboard seamless. Detaching the Dell XPS 12 from the keyboard is also easy – simply push it out a little and pull. Talking about the keyboard, it is arguably one of the best ever seen on a 2-in-1 laptop. It is not cramped up like what you get on many of its rivals and should deliver typing experience very comparable to that on a regular-size laptop. The keyboard, which Dell says was developed based on feedbacks from customers, offers 1.9mm key travel and a Precision touchpad. Dell XPS 12 sports a 12.5-inch diagonal display with a stunning resolution of 3840 x 2160 pixels. The 4K Infinity Display is the first of its kind on a 2-in-1 device and promises awesome viewing when watching movies or executing other tasks. According to Dell, the touchscreen uses Indium Gallium Zinc Oxide (IGCZO) technology to help it deliver 100% colour gamut accuracy. The XPS 12 is also offered with a Full HD (1080p) display. The hybrid is armed with latest Intel Core M processor, which runs the show at speeds of up to 2.7 GHz. While the processor used on the Dell XPS 12 may not be the best that could have been used, it is very power-efficient, meaning you are in for long battery life. Backup is provided to the chip by generous RAM of up to 8GB. It boots Windows 10 operating system for the best of user experience. Zippy solid-state drive of either 128GB or 256GB capacity is provided for storage. Bluetooth 4.1 and Wi-Fi 802.11ac are provided for wireless connectivity. Dell XPS 12 features two USB Type-C ports with Thunderbolt 3 and a full-size SD card reader among its interface options. The hybrid packs an 8-megapixel rear-facing camera and a 5-megapixel front-facing camera. Dell XPS 12 2-in-1 laptop is not yet available in Nigeria. HP XPS 12 price in Nigeria is expected to start at around N160,000, depending on your location and the configuration of the laptop.